Today in Tanzania gender equality is enshrined in the Constitution (1977 and its revision in 2001) and the Bill of Rights (1984). Under these the Government recognizes that women’s advancement and achievement of gender equality are a matter of human rights and a condition to social justice and reaffirms its commitment to enhancement of women’s rights for national and world progress. Despite these provisions, the Initial National Communication (INC) and the National Adaptation Plan of Action (NAPA) produced by the Government of Tanzania for the United Nations Framework Convention on Climate Change (UNFCCC), did not incorporated gender considerations. 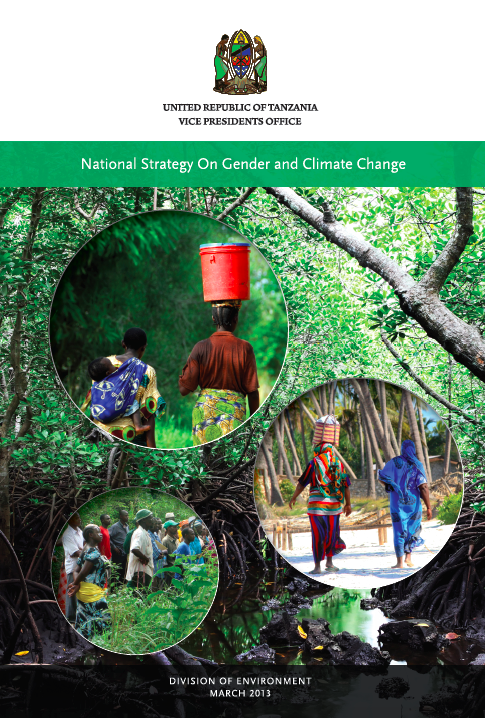 The, Vice President’s Office (VPO) is therefore presently addressing this shortcoming by including gender as a crosscutting topic in the development of its National Climate Strategy and Action Plan as well as in its Second Communication Report (SNC). This National Strategy for Mainstreaming Gender in Climate Change in Tanzania is the result of collaboration between the Vice President’s Office – Environment of the Government of Tanzania, Gender Office of IUCN, the IUCN – ESARO and its Tanzania Office; and other key national institutions in Tanzania. The Strategy is the result of a series of inputs, including interviews with policy makers, stakeholder consultation and research, and a stakeholder workshop held from the 28 – 30 of September of 2011 in Dar es Salaam, United Republic of Tanzania (see annex list of participants, Annex 1), amongst others. It has been drafted on the basis of an analysis of the current national priorities concerning climate change.